Sleepwalker Shutdown timer is an app which allows you to shutdown or start up your windows PC automatically. 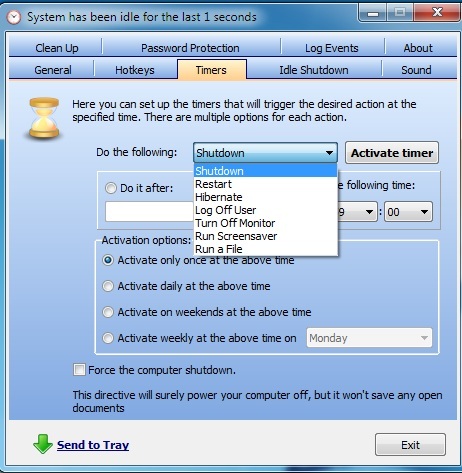 With the help of this small app you can set the day and time to shutdown and restart time on your PC. The app comes with lots of features, which are really useful to all windows users. Also the app allows you to clean up temporary data on restart. You can also use hot-keys to shut down, restart, hibernate, log off, power down the monitor or simply run the screensaver. The app is easy to use, all you have to do is install the app on your windows PC and your are ready to go. It’s a small and user-friendly app, it can be copied to a flash drive or moved without having to reinstall the application. The best part of the app is timer, from here you can set specific day and time to shutdown, restart, hibernate, log off, turn off monitor, run screensaver on your windows machine. All you have to select the option that you want to use on your PC and set the date/time and hit the activate timer. 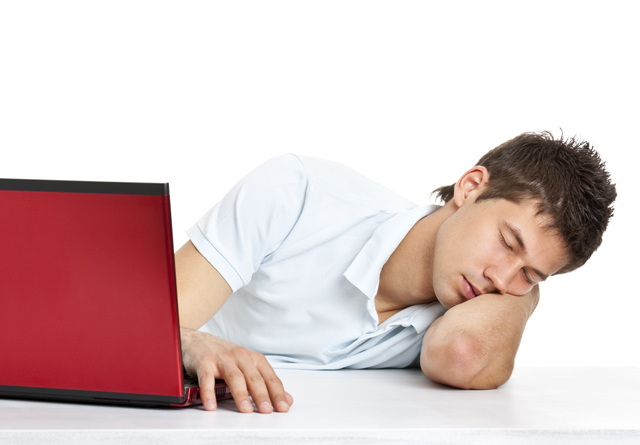 To save your time on windows PC, SleepWalker give you the keyboard shortcuts that you can use for shutdown computer, restart computer, hibernate the PC, log off user, power down monitor and run the screensaver. Another useful feature of the app is Disk Cleanup. With this feature you can clean all the temporary files from your PC. Go to the cleanup option and you can choose to clear all temporary files before acting upon the specified action. 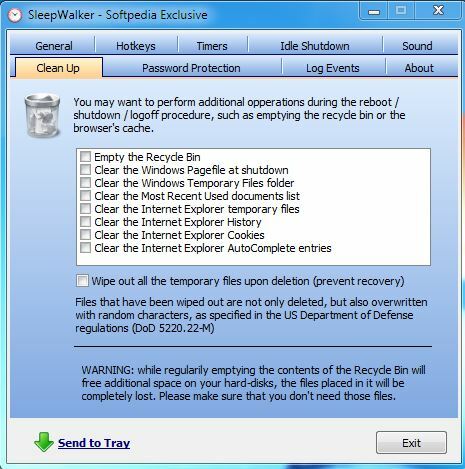 Sleepwalker is one of the best tool which improves the operating system’s shutdown capabilities. You can try this app on your windows PC free. We tested the app on Windows 7, 64-bit edition. It supports Windows XP, Windows Vista, Windows 7 and Windows 8.